Anyone in the online news business knows there are certain figures who draw consistent interest from readers. Those same people will likely tell you that Senator Elizabeth Warren, the progressive doyenne who's cultivated a passionate national following in her two years on Capitol Hill, is clickbait. It's a phenomenon that Vox's executive editor Matt Yglesias observed recently on Twitter. "Social strat: when in doubt, link issue to Elizabeth Warren and watch the Facebook shares roll in," he tweeted. 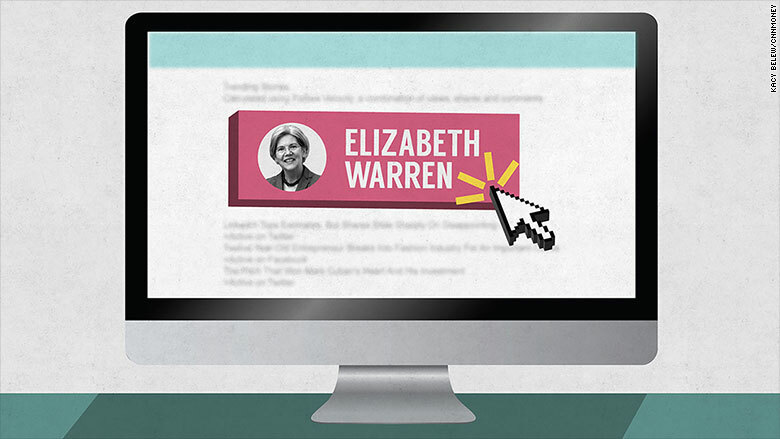 It might seem odd to place a wonkish crusader against Wall Street in the same category as cat videos and celebrity slideshows, but Warren is an online sensation in her own right. Perhaps the truest testament to her clickiness can be seen on Upworthy, the viral content factory that launched in 2012. Warren has been featured in more than 40 Upworthy posts. Three of those stories have generated more than one million page views -- more than any other public figure who's been covered by the site. Those posts rank among the top 5% of all of the stories published in the site's three-year history. 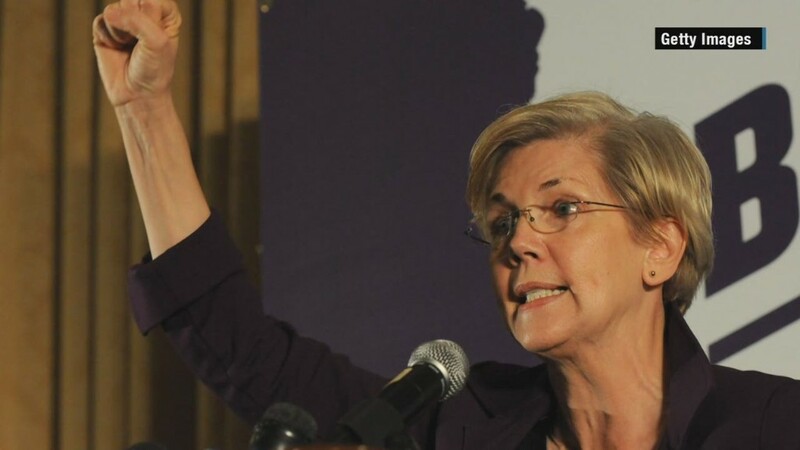 Eli Pariser, the co-founder of Upworthy who previously led the liberal activist group MoveOn, said Warren represents a "fantastic, unusual protagonist" in a story that resonates with many Americans. "She's this grandmotherly type taking on Wall Street," Pariser said. The Massachusetts Democrat may be most attractive to left-leaning sites like Vox and proudly progressive sites like Salon. But Warren stories are a hit on CNN, too. There was a reason Warren was the only Democratic lawmaker named in the headline when CNN's Brian Stelter wrote last month about the liberal opposition to the proposed Comcast-Time Warner Cable merger. Vox has published 36 stories with Warren's name in the headline since the site launched a little more than a year ago, and -- as Yglesias suggested -- many of those stories were widely shared on social media. Yglesias wrote last month about Warren's "game-changing idea" to transform bank regulations, and the story was shared more than 8,000 times on Facebook. Vox editor-in-chief Ezra Klein's story in February about Warren's "furious" opposition to Obama's proposed trade deal was shared more than 3,000 times. Compare that to Bernie Sanders, another progressive champion in the senate who just announced that he will run for president. When Vox wrote in January that Sanders was "livid" about the trade deal, it racked up only 188 Facebook shares. Luke Brinker, Salon's political editor, said that Warren "easily ranks among our most-covered lawmakers" and that a "large chunk" of the site's readership would have liked for her to run in 2016. This year, Salon has put Warren's name in 23 headlines. "Our Warren content tends to be some of the best-performing on the site," Brinker said. "She's a really galvanizing symbol for progressive-minded readers." Pariser said she resonates with readers more readily than other progressive lawmakers. "Tom Harkin may have been as good, or as passionate, about a bunch of these issues," he said, referring to the retired Democratic senator from Iowa. "But it didn't have the kind of drama that she does." He compared her popularity on the social web to the way heroes of previous generations were lionized. "In the '30s, you had folk heroes memorialize in songs," Pariser said. "Now it's social media. It's the same thing. You have people getting excited about the protagonist who stands for what they believe in and how they want things to be."